I looked at some of my bees today and noticed that a few of the hives were low on food stores. I didn’t want to start feeding syrup yet because this would promote brood rearing. With cold weather on the horizon, excessive brood could lead to colony starvation. I opted for feeding granulated sugar. 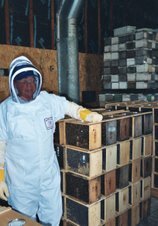 Here’s how you can feed your bees during the cold winter months without promoting brood rearing. Remove the covers off the top of the hive. The cluster of bees should move to the top of the hive when they are low on food stores. Smoke the bees and lay a single sheet of wax paper on top of the frames. I made a 1-1/2" shim to sit on the top of the box. Pour granulated sugar across the hive on top of the wax paper. Heap it up as necessary. The bees will eat the sugar and it will not be stimulated for brood rearing. They will chew the wax paper while consuming the sugar. It is easy to peek later on to see if the food is gone or not. If it is gone or there is just a little left, give them more wax paper and sugar. Remember to leave access to the sugar never cover all the frames with wax paper. Being the sugar is under the moisture board and inner cover it will moisten by the bee's respiration. I usually throw a little snow on part of the sugar to give them water right away. Put the covers back on (inner cover, moisture board, winter cover, and, finally, telescoping cover).